Vijayawada is a beautiful city in the Andhra Pradesh Capital Region, in the Indian state of Andhra Pradesh. With over 1 million people, it is the second most populous city in Andhra Pradesh. Vijayawada is a commercial and industrial city that welcomes all. Touristic attractions of this luminous city include Kanaka Durga, Prakasam Barrage and Rajiv Gandhi Park. Cheap flights to Vijayawada are now available for a limited period of time, so get ready to take in the pure wonders of this incredible city! Vijayawada is home to Vijayawada International Airport (VGA), which is a 30-minute drive from the city centre. Enjoy the aromatic aromas of the magnificent cuisine in the Andhra Region. 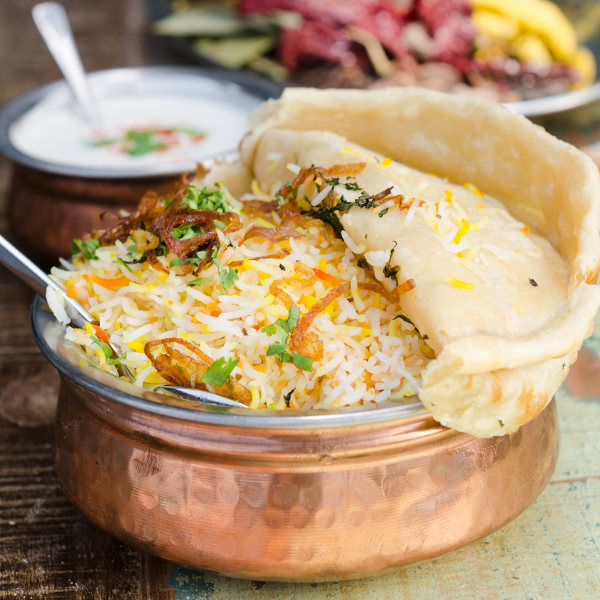 Amongst the delicious and flavoursome Indian dishes is a variety of biryanis. A journey with your palate through the city is definitely worth taking in Vijayawada. 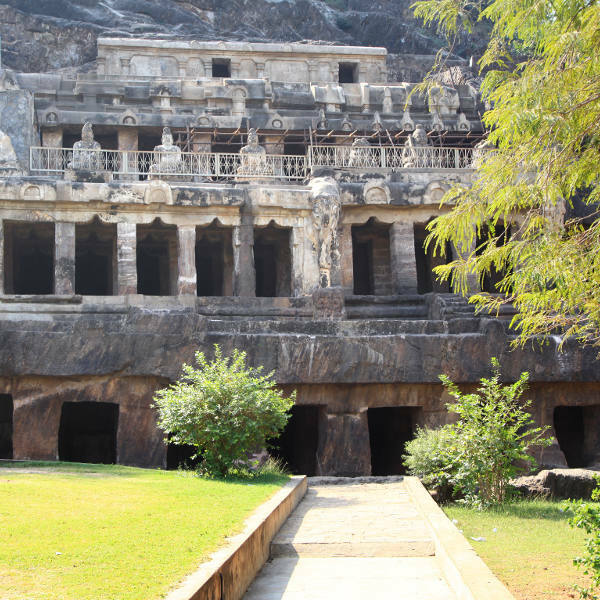 What a sight to behold, the Undavalli Caves showcases the amazing Indian rock-cut architecture. Beginning as Buddhist temples, they are carved out of solid sandstone. These exotic caves are a magical treat for history lovers. Shopping in this amazing city will surely leave your travelling-soul enriched. 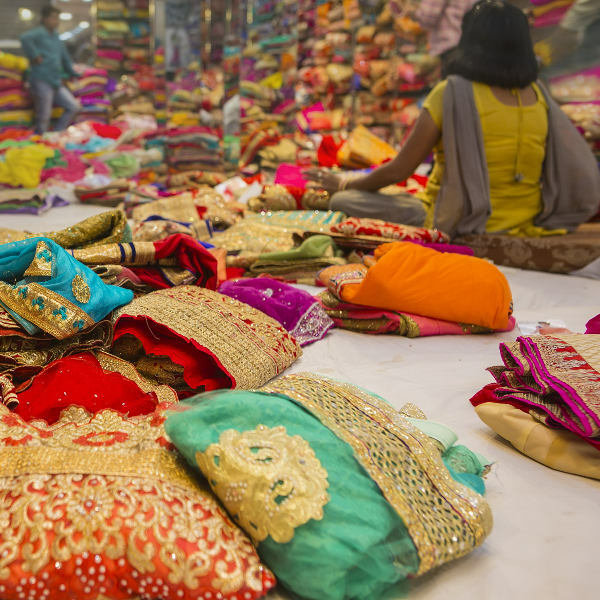 There are various marketplaces with amazing souvenirs, including Kondapalli and Tarapet. Get your hands on traditional sarees and mango pickle which are native to Vijayawada. Vijayawada has a tropical climate throughout the year. Tourists can expect hot summers, moderate monsoons and pleasurably mild winters. The best time to visit Vijayawada is during winter (October – February). The climate is much more pleasant during the winter months. During summer (March – June) temperatures go as high as 43°C, days are unbearably hot and humid. The peak season in Vijayawada takes place during winter as the weather is bearable and there are festivals taking place during this time. Festivals in the city include the Lumbini festival, Deccan festival, Diwali and Dussehera. Vijayawada translates to “The Place of Victory”. It is the third largest city in Andhra Pradesh, India. Vijayawada is nestled on the banks of the Krishna River. The city is richly blessed with incredible attractions. Discover the amalgamation of a modern city and its ancient ruins. Tourists are treated to wonderful sites, including numerous temples and caves which have survived throughout the centuries. Vijayawada is the ideal destination for tourists pursuing spiritual enlightenment, as the city transcends you to a heightened space surrounded by the blissful elements of nature. Visit the Kanakadurga temple, where it is considered fortunate to seek the blessings of the goddess before venturing through the spiritual city. Vijayawada offers a variety of accommodation and breath-taking attractions, which will sincerely be appreciated by all who venture to this amazing city! Compare several airlines and book your cheap flights to Vijayawada online at Travelstart! Travellers should be up-to-date with routine vaccines, including the measles-mumps-rubella (MMR) vaccine, diphtheria/pertussis/tetanus(DPT) vaccine, poliovirus vaccine, varicella (chickenpox) vaccine and yearly flu shot. Travellers are also advised to get vaccinations against hepatitis A, hepatitis B, malaria, rabies and typhoid. Ensure that you obtain a yellow fever certificate before departure, which should be produced upon arrival in Vijayawada. Vijayawada is a safe city with friendly and helpful locals. Tourists are still advised to remain vigilant throughout their tour.